Do you know what is meant by "local search marketing"? Essentially, this term refers to using the search engines to make sure that people who are searching for local businesses will find your information as a local business. Google took a step a while back to make sure that people who were looking for a local business found just that at the top or near the top of the first search result page. Since then, Yahoo and MSN created their own local search results. There are quite a few hoops you need to jump through to get your business listed on the first page. 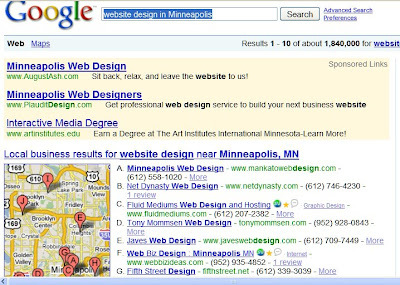 Let's say you searched in Google for "website design in Minneapolis" because you want your new website to be built by someone you can easily meet with and discuss the project in person. It is good to know your website person personally, right? If you did that search today, 2.3.09, you would see what is shown on the picture above on the first page of Google search results page (SERP). Go ahead. Type your own search for your business. Be aware that Google local results are not found for every search. Now search for "insurance in paso robles". Do you see the Google balloons that indicate the locations of various insurance agencies? That is Google Local. I will do a series of articles on Google Local. Stay tuned. It is important for the future success of your business.